In the downpour this morning (around 8:30am) masses huddled under the awing behind the Queen Victoria Building waiting for a 441 or 442 to Balmain. Unfortunately there had been an three car accident on the Anzac bridge causing traffic delays. Not that the buses are know for being on time after 8am. Over 30 minutes later 2 buses arrived, and everyone packed in. 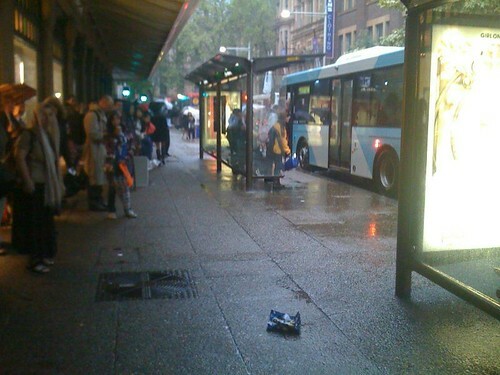 This entry was posted in Photos and tagged bus, bus stop, CBD, photo, QVB, rain. Bookmark the permalink.